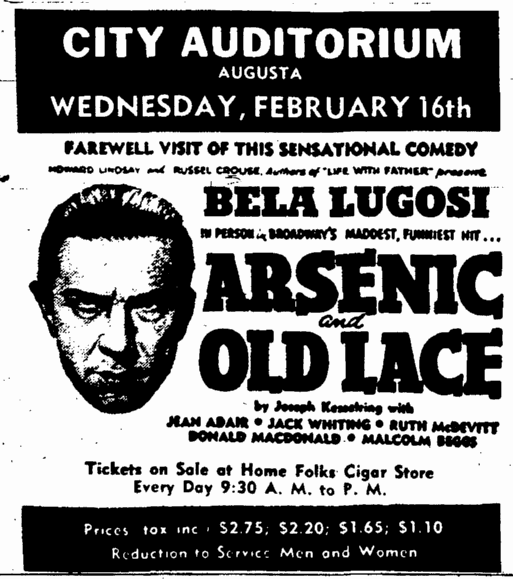 AUGUSTA, Ga., Feb. 12. 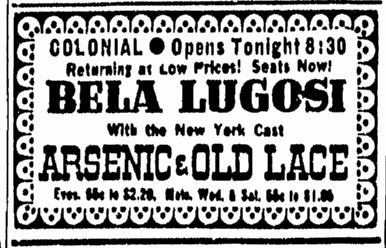 – Local businessmen have formed a new enterprise. 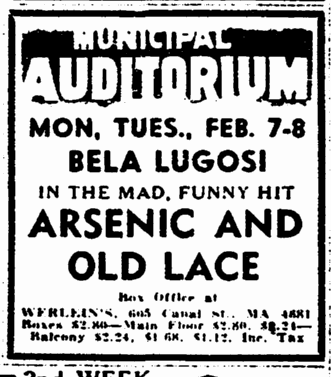 Auditorium Attractions, to present roadshows, name bands and concert artists at City Auditorium. 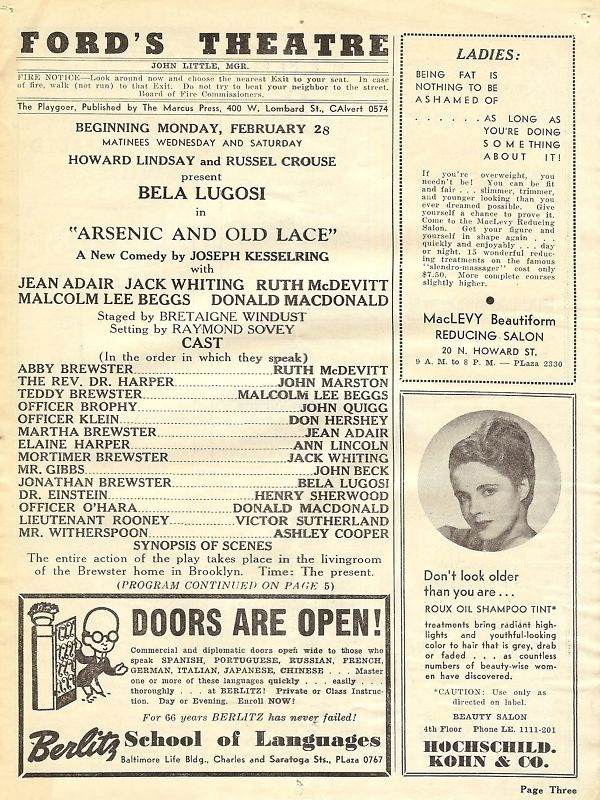 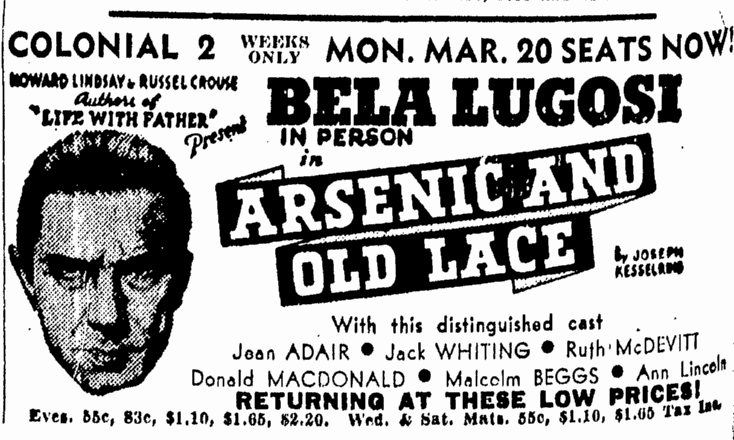 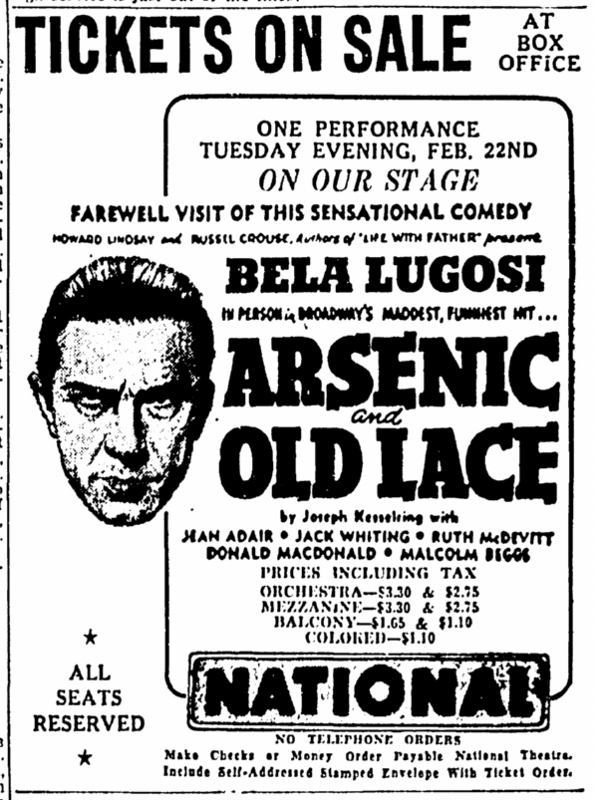 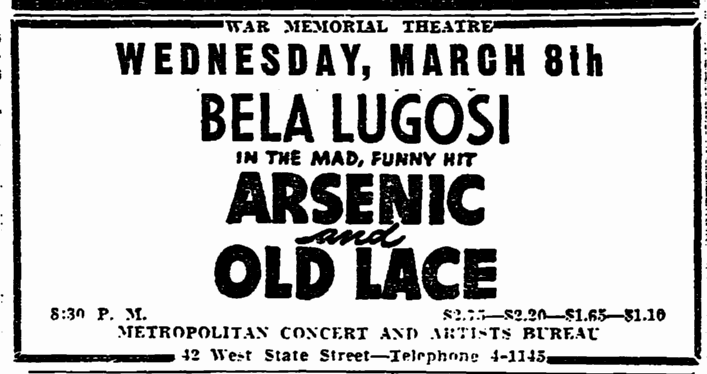 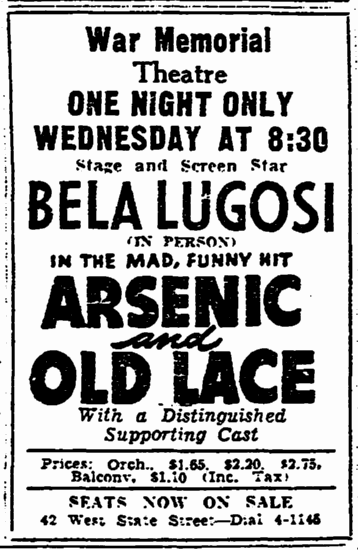 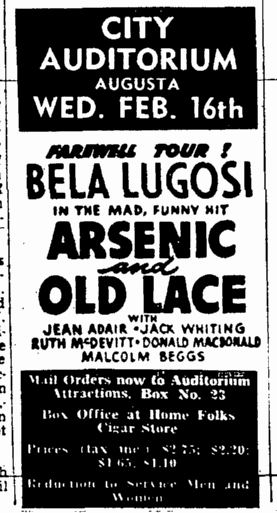 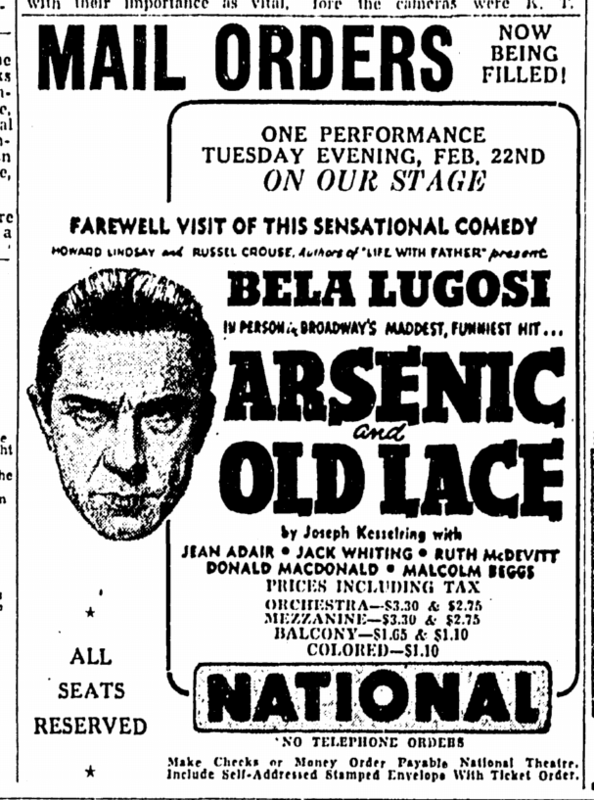 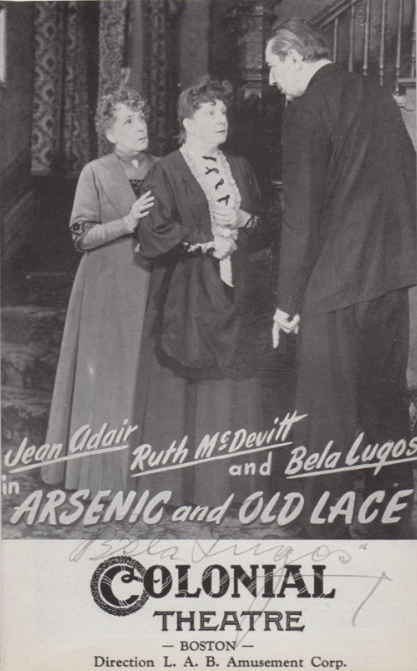 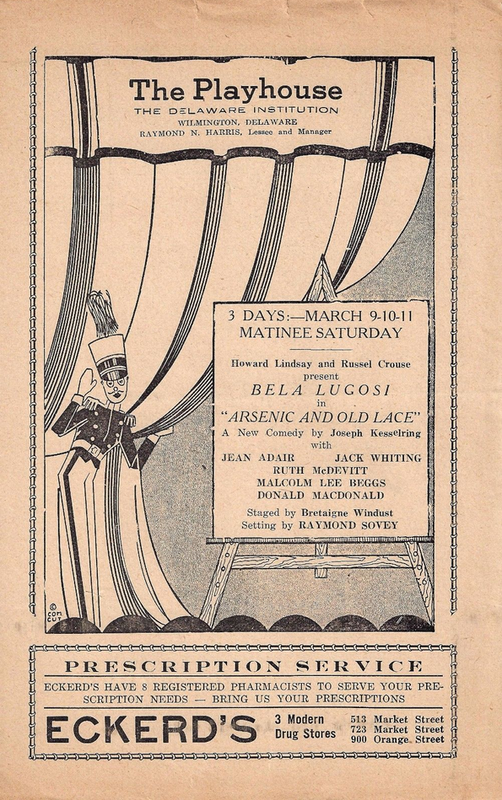 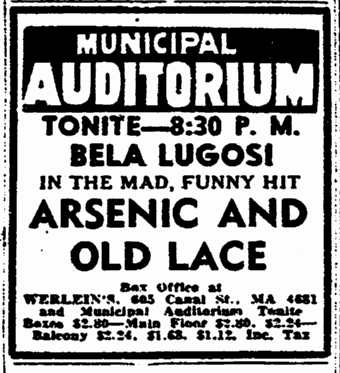 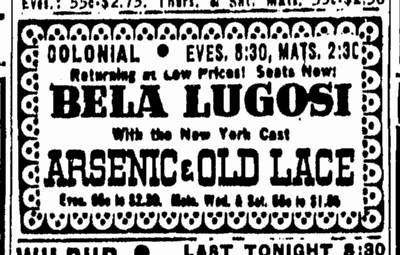 Arsenic and Old Lace, with Bela Lugosi, comes in February 16, to be followed by Junior Miss, Tobacco Road and Abie’s Irish Rose. 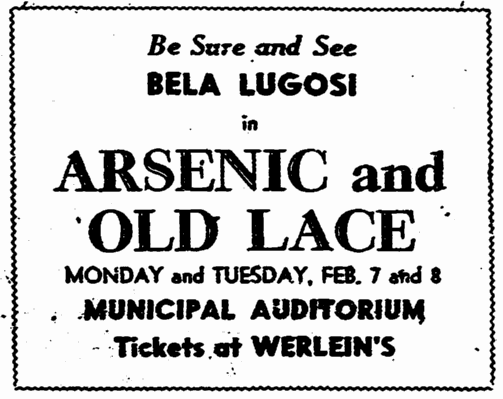 Arsenic will be the first roadshow to stop here in three years. 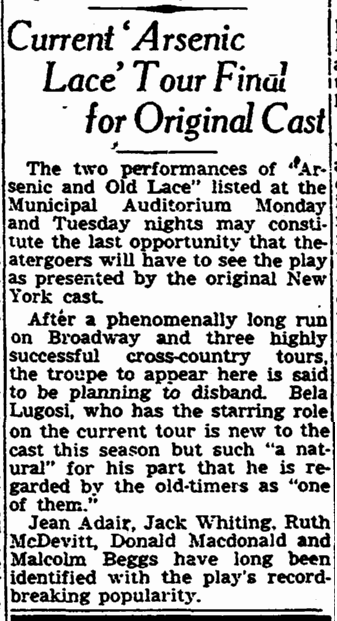 Eddie T. Lewis, well-known showman, is head of the new company. 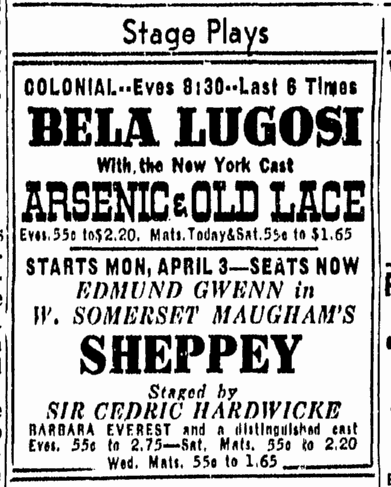 BALTIMORE, March 4. 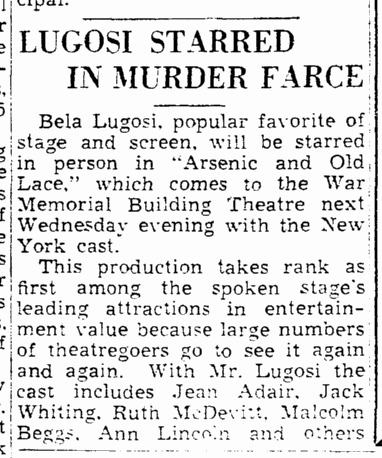 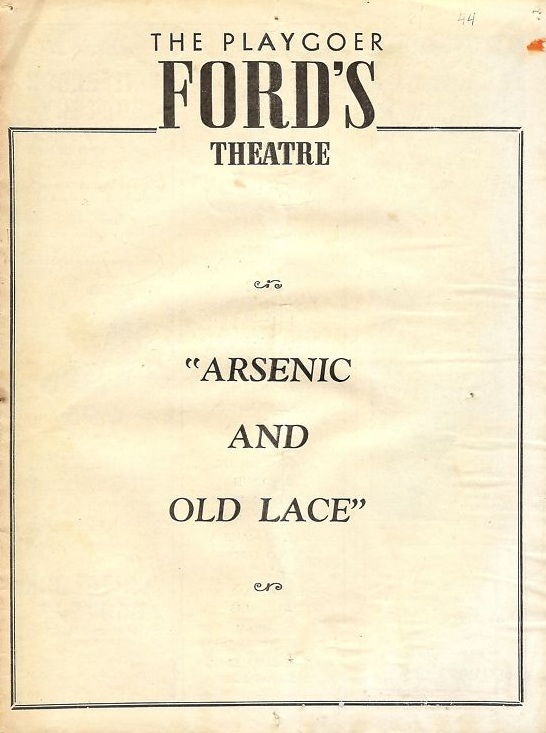 – Return engagement of Arsenic and Old Lace at Ford’s Theater, second of season, grossed a fine $14,000, which compares with the $17,000 grossed the season’s opening in September. 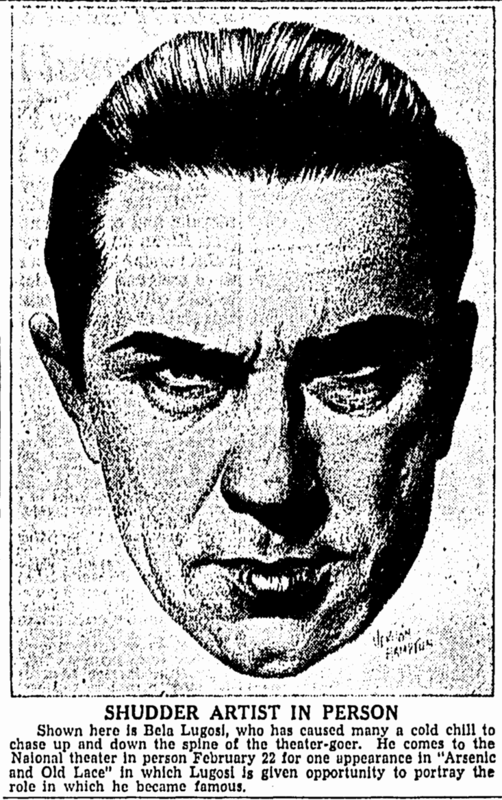 Bela Lugosi headed the cast. 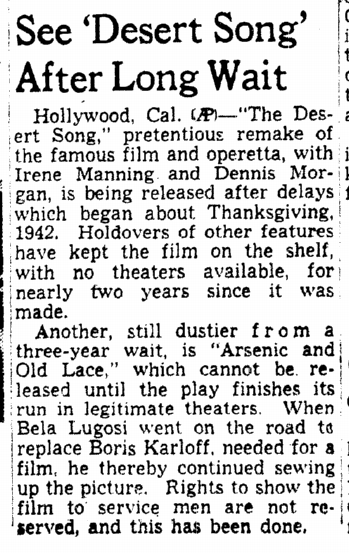 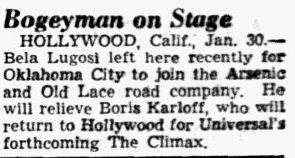 Last September Boris Karloff held the stellar role. 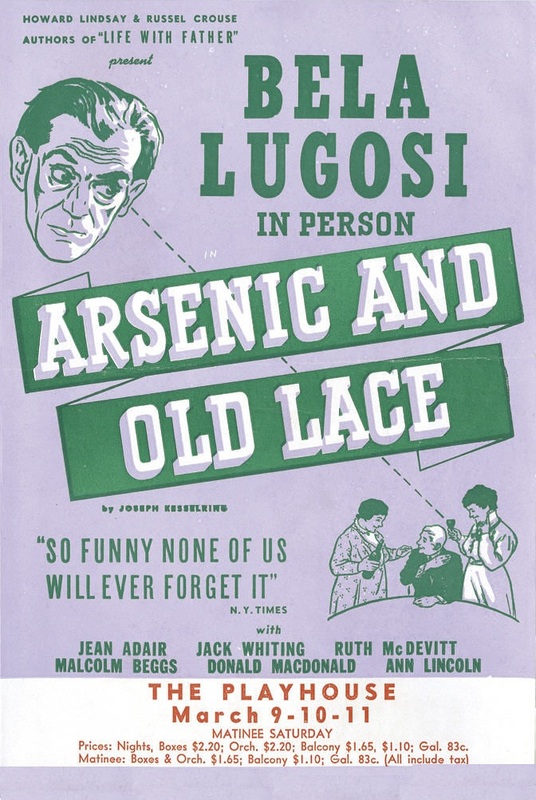 “Arsenic and Old Lace” the play concerning two old ladies who commit murder with childlike innocence, is back in town for the fourth time. 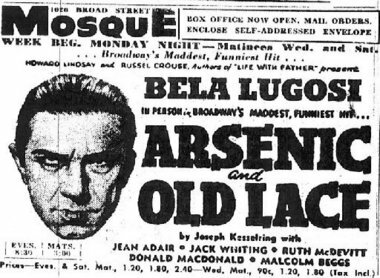 On this occasion Bela Lugosi is the star, having taken over the part formerly played by Boris Karloff. 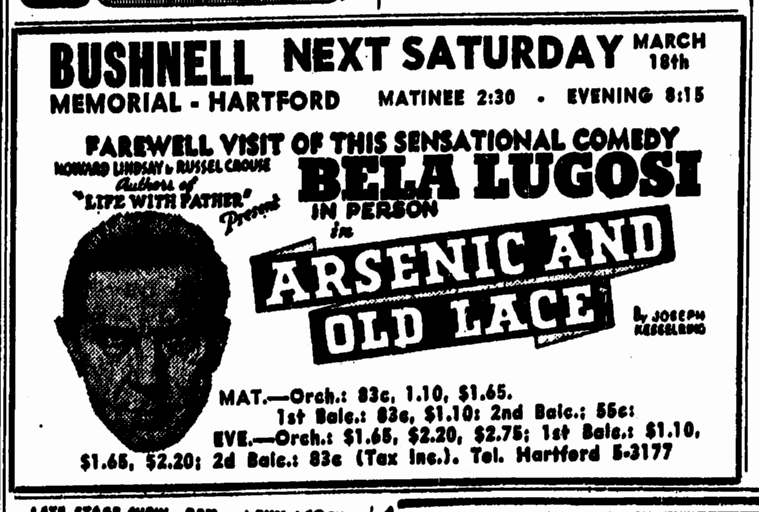 If you didn’t see “Arsenic and Old Lace” on any of its previous runs here, try and get tickets for it next week. 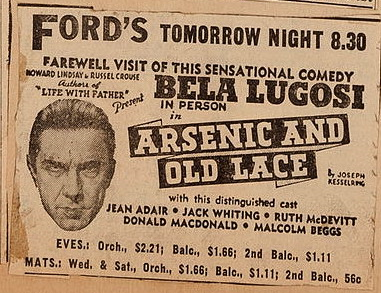 Of course you could see a couple of movies for the price of this show, but money spent on this one is a fool proof investment. 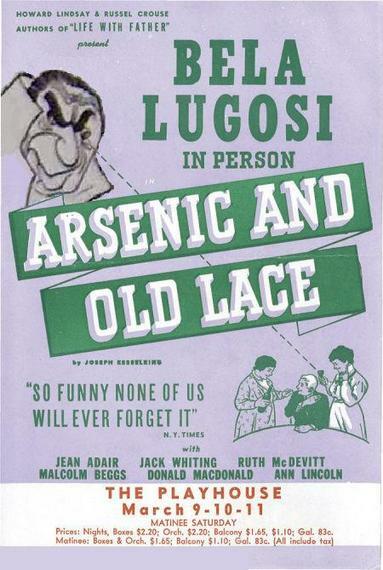 There are very few present day comedies that equal it. 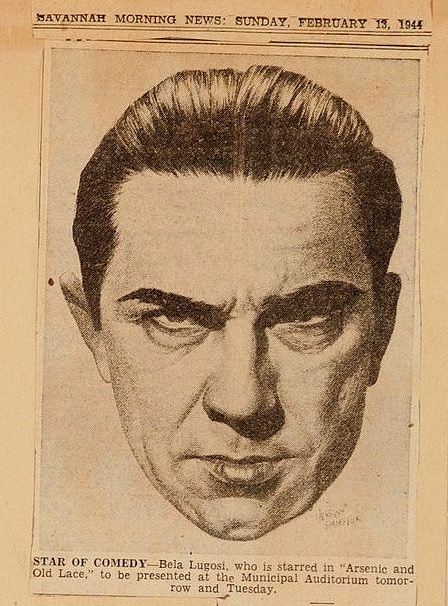 Photograph by Vandamm Studio, 130 West 57 St., New York, N.Y. 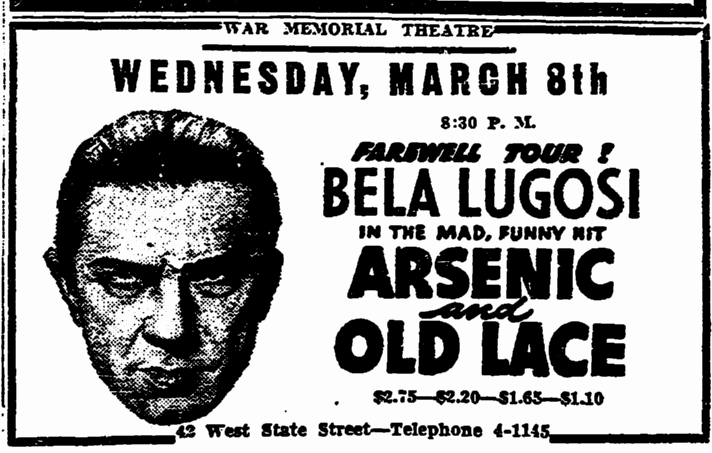 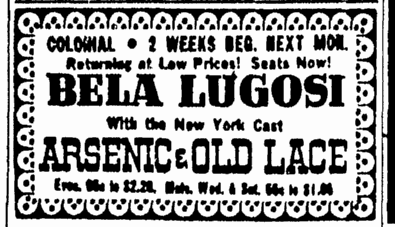 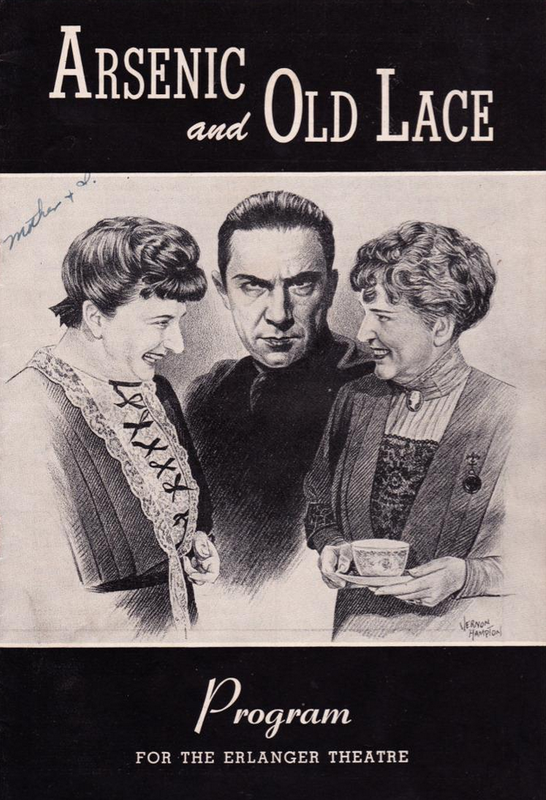 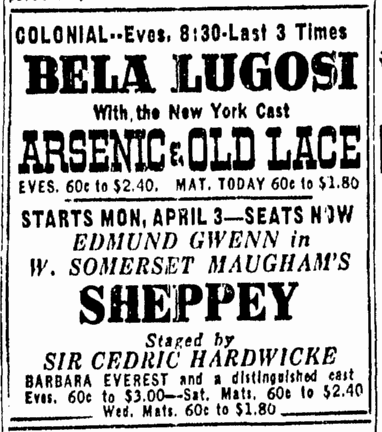 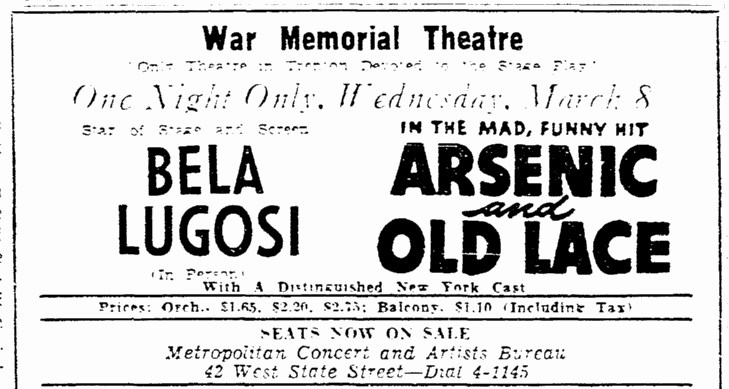 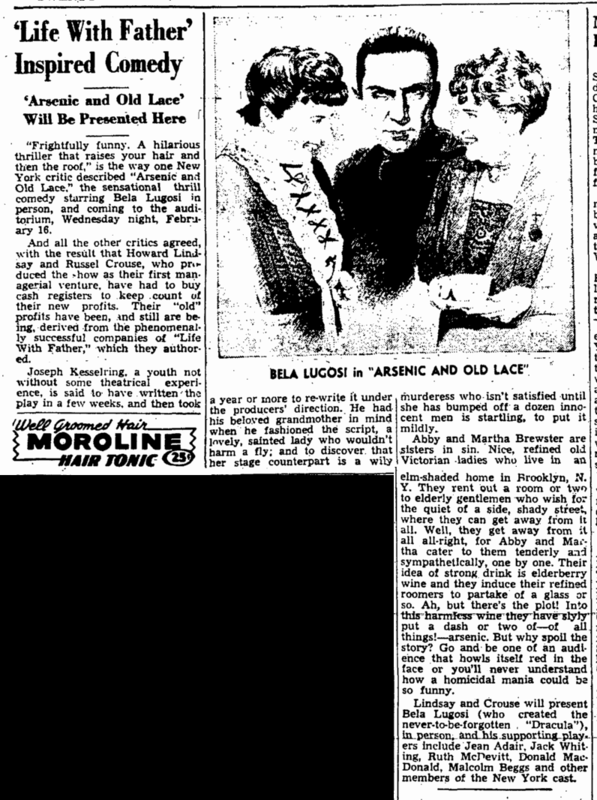 Starring the famous Bela Lugosi in person, “Arsenic and Old Lace,” the hair raising comedy hailed by New York’s critics as a play no one would ever forget, is due at the Mosque Theatre, Newark, April 24, for one week’s engagement, with matinees Wednesday and Saturday. 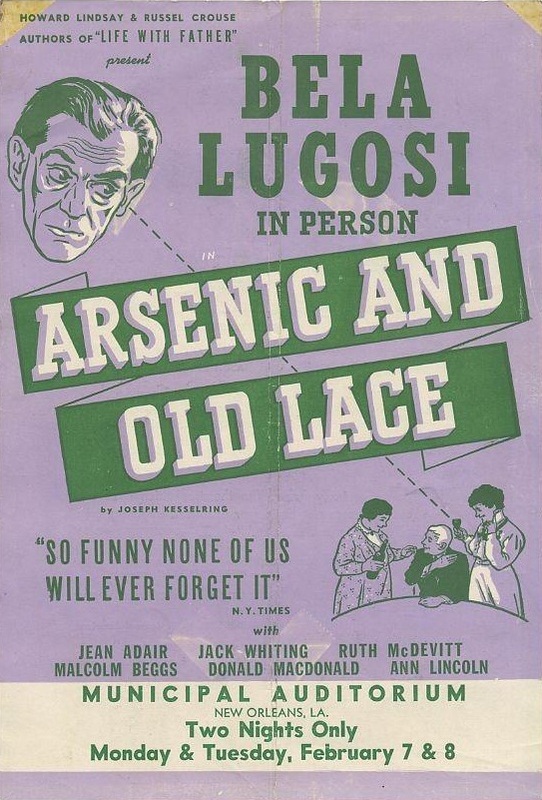 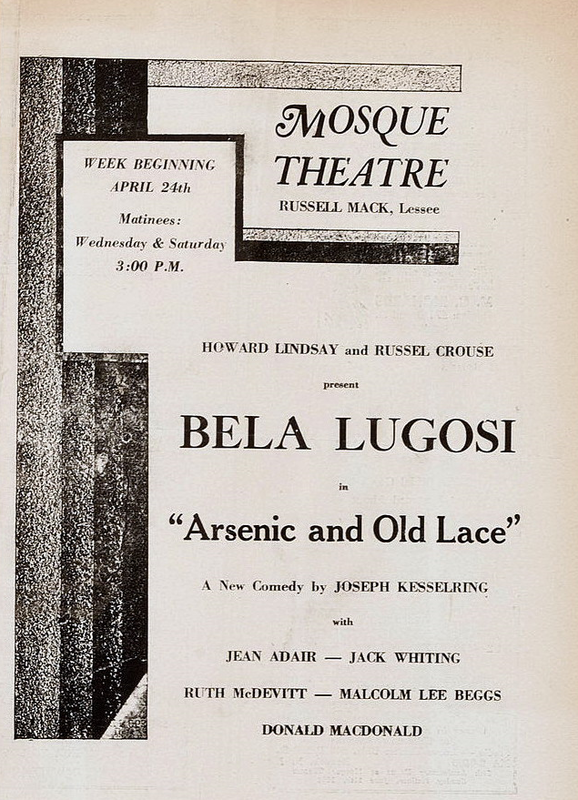 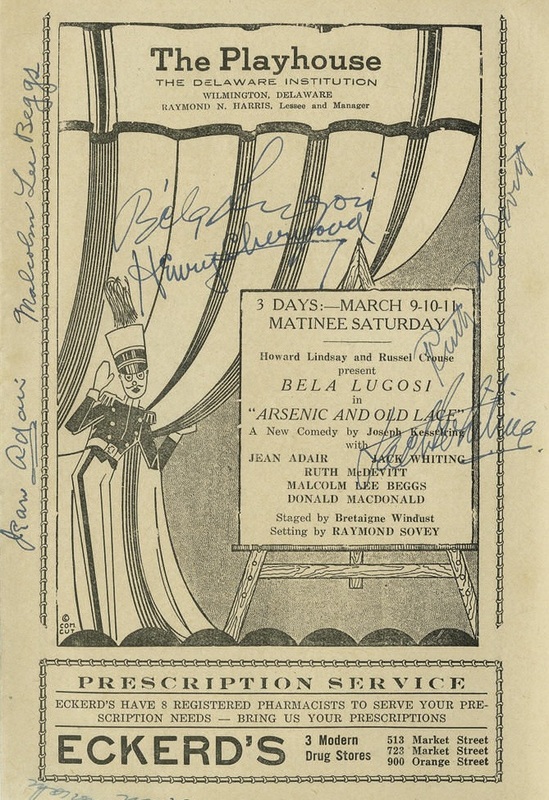 Written by Joseph Kesselring, “Arsenic and Old Lace” is the first production by the Messrs. Howard Lindsley and Russel Crouse, two gentlemen not altogether unknown to the theatre, for it was this team who wrote “Life With Father,” and numerous others. 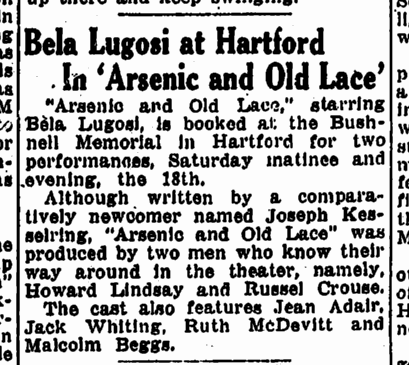 Bela Lugosi will bring the cast that has shared honors in the play’s success for the past three seasons. 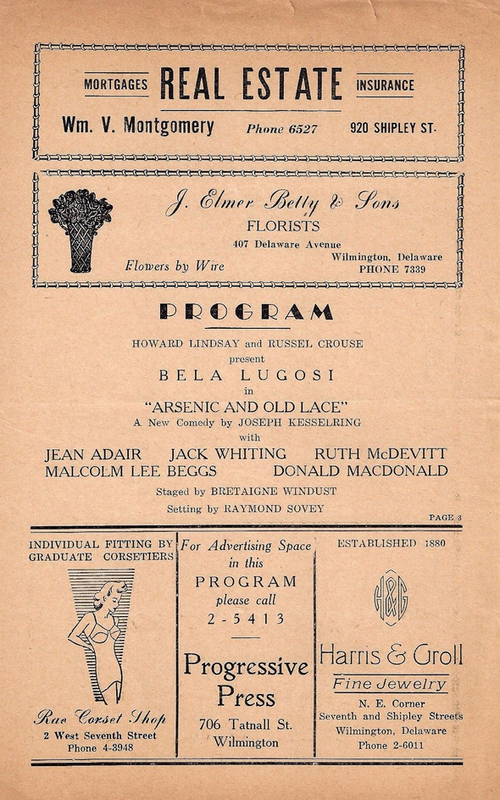 Jean Adair, Jack Whiting, Ruth McDevitt, Donald Macdonald and Malcolm Beggs are featured.